Personalized Stationery Blog – Gifts In 24 » Blog Archive The Party Rookie: How Many Napkins Do You Need? « Have You Seen This Must-Have Party Accessory? The Party Rookie: How Many Napkins Do You Need? Oops…Did you order too few napkins? Personalized party napkins can take an uninteresting table setting from humdrum to hubba hubba. 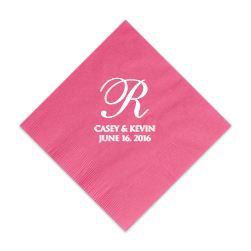 At Giftsin24 it’s easy to create the perfect personalized napkins for your next party. But do you know how to estimate napkins so you order the correct amount? Order too many, and you’ll be using them for the next several months. Order too few and, well, your guests will be a little uncomfortable. Now that you’ve added some glitz, don’t make a rookie mistake and order too few napkins. There’s nothing more awkward than getting caught short-handed at the buffet table, beverage bar or powder room. Drinks during an open bar or cocktail hour: one napkin per hour per guest. Passed hors d’oeuvres before a meal: one napkin for each piece of appetizer you serve. Dessert or cake: one napkin per guest. Dinner napkins for a meal: one towel per guest, plus extras “just in case.” Order two per guest if serving saucy food or food that is eaten with the hands. Hand towels in the restroom: two to three per person for a three- to four-hour party. If you have a longer reception, plan on more. Whether you want traditional, white embossed napkins or snazzy foil-stamped napkins in vivid hues, you can find an amazing array of designs, motifs, paper colors, foil colors and lettering styles that hit the right note for your event. You can find napkins for weddings, anniversaries, birthdays, graduations, holidays and many more occasions. They’ll add that special touch to your next party. See all of our precision-crafted napkins here.